The Eureka Stockade (originally referred to as the Eureka Massacre) has an unusually high degree of public consciousness for what reads like a somewhat underwhelming event. It was a fenced off enclosure of Diggers (miners) who in 1854 raised a flag, made speeches of defiance and fired revolvers into the air. Unfortunately, stirring speeches, inspiring flags and guns fired into the air were no match for sound battle planning. After deciding to attack, the British colonial forces took less than 15 minutes to defeat the Diggers and tear down their flag. For military buffs, this was perhaps quite an expected outcome. After all, it is never a particularly sensible strategy in guerrilla warfare to confine all your soldiers in one easily identifiable location. While the battle was not a great stand that would resonate alongside the legends of Spartans, the events leading up to it as well as those followed perhaps explain why it has been remembered. Australia was a corrupt dictatorship for the first 50 years of its modern history. Governors had unquestioned authority and the military used their power to the strategic interests of themselves and the colony's elites. A man could simply be picked off the street and flogged for something as trivial as having his hands in his pockets. In 1853, the discovery of gold sparked massive waves of immigration. Miners from all over the world descended upon Australia and brought with them ideas of liberty, equality and fraternity. But the authorities treated the new arrivals in the same manner they had been treating the Convicts. They levied a crushing licence tax on the prospectors and troopers used whips, musket butts, boots and bayonets to collect it. Mounted troopers would engage in "Digger hunts" through the goldfields where prospectors would be ridden down in front of their comrades, beaten up, charged, and then fined. "McGregorius is not charged with being without a licence, but with assaulting the trooper Lord - ridiculous! This alters the case. The trooper is called, and says the old story about the execution of 'dooty,' that is, licence-hunting. A respectable witness takes his oath that he saw the trooper strike the foreigner with his clenched fist, and knock him down. The end of the story is in the Ballarat tune, then in vogue: 'Fined five pounds; take him away.' "
Anti-trooper sentiment reached boiling point when a Digger, James Scobie, was murdered on October 17 1854. Some Diggers believed the culprit was the local publican. An angry mob agreed and thousands gathered to deliver the verdict. The local commissioner tried to calm the mob but eggs soon appeared and started being thrown towards his face. A short time later the publican's hotel was on fire. While it was burning to the ground, liqour bottles were salvaged, distributed to the crowd, and drunk in "colonial style." In other words, the mob got really pissed. There was great celebration as the hotel finally collapsed in flames. Symbolically, the Diggers saw it as a sign that they were the new masters of the gold field. "Will four thousand of you volunteer to march up to the camp, and open the lock-up to liberate the man?" "Are you ready to die"
Revolvers were fired into the air and licences were burnt. An universal well rounded AMEN, was the determined reply: some five hundred right hands stretched towards our flag. The earnestness of so many faces of all kinds of shape and colour; the motley heads of all sorts of size and hair; the shagginess of so many beards of all lengths and thicknesses; the vividness of double the number of eyes electrified by the magnetism of the southern cross; one of those grand sights, such as are recorded only in the history of 'the Crusaders in Palestine.'" Over the next few days, more than 1,500 men trained at the stockade in preparation for battle. While all showed a keenness to fight, the Digger's trump card was likely to be 200 well-armed Californian Rangers equipped with horses and guns. The Diggers' words were strong, but they were short of weapons and planning. Diggers came and left, while others went about their business looking for gold. Other Diggers foolishly believed that no attack would occur on a Sunday, the day of the Sabbath, and simply weren't prepared. More foolish was the decision to concentrate all the forces in one location. It certainly wasn’t the typical guerrilla warfare playbook. 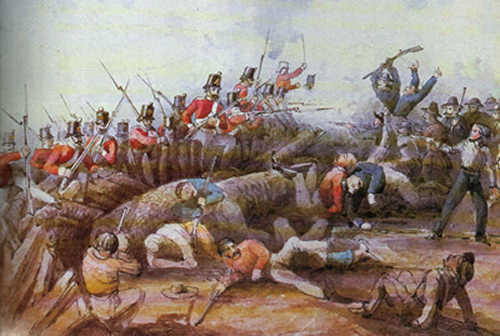 After surveying the situation, the British assembled a force of some 300 men. A false rumour was planted amongst the Diggers that more British reinforcements would be coming from Melbourne. Gallantly, the Californian Rangers rode off to intercept them. Free grog also mysteriously appeared amongst the Diggers' campsites. Rather than question where it came from or conclude that a sober mind was needed with battle on the cards, the Diggers ensured that the grog didn't go to waste. With the Rangers out of the way and other Diggers attending Church, work issues or just passed out in a state of intoxication, the stockade was being defended by less than 100 men. It was not enough. At 4.45am on December 3, the first shots rang out. 30 Diggers, armed with metal pikes, quickly rallied to engage the soldiers armed with muskets. While brave, the pikemen didn't fare too well against guns and the sight of them being slaughtered caused other Diggers to flee.
" Her Majesty's forces were this morning fired upon by a large body of evil-disposed persons of various nations, who had entrenched themselves in a stockade on the Eureka, and some officers and men killed. Several of the rioters have paid the penalty of their crime, and a large number are in custody. All well-disposed persons are earnestly requested to return to their ordinary occupations, and to abstain from assembling in large groups, and every protection will be afforded to them by the authorities. God save the Queen. " Over 1,500 men trained at the stockade in preparation for battle but only 13 were arrested and tried with treason. Two of these men were black, one was an Italian (Carboni), another was a Jew and the rest were Irish. It seemed that British authorities had specifically targeted non-Anglos to be the criminal face on show. If so, the play backfired as only one found non-guilty by a jury. One of the men, John Joseph, a black man from America, was carried around the streets of Melbourne in a chair in triumph by over 10,000 people. Carboni was elected to the local court at Ballarat to adjudicate mining disputes. Most of the defence arguments rested on the accused stating that they had not been fighting or had been forcibly dragged into the stockade and kept against their will. In the case of Timothy Hayes, an argument was made that his wife would have been a better soldier. She appeared in the court to confirm it as she chastised him for being captured and declared that if she had been a man, she would not have been taken by the likes of his accusers. Such humour seemed to be quite effective as the jury had trouble reconciling the accused as people as being capable of fighting a battle. “The Australian flag shall triumphantly wave in the sunshine of its own blue and peerless sky over thousands of Australia's adopted sons. And when the loud paean of "Now's the day and now's the hour, See the front of battle lour!" shall have pierced the blue vaults of Australia's matchless sky from the brave men of Ballarat next Wednesday at Bakery Hill there will not be one discordant voice in the sublime and heroic chorus. Go forth, indomitable people, gain your rights, and may the God of creation smile down propitiously upon your glorious cause. Forward! People, Forward!" Seekamp was sentenced to six months jail but was later released three months early. The leader of the rebellion, Peter Lalor, lost an arm in the battle and was hidden while the other men went on trial. After they were acquitted, Lalor's arrest warrant was withdrawn and he stood for the new Victorian parliament. As a hero, he was elected with much euphoria. However, he soon found that it was more difficult to become popular by making decisions in a democracy than it was by saluting a flag, making a speech and firing guns into the air. He used Chinese contract labour to break the picket lines of striking miners, he opposed an elected upper house, opposed universal manhood suffrage and voted for bills that empowered the rich. After leaving the people of Ballarat feeling betrayed, Lalor stood for the seat of South Grenville and enjoyed a long career in politics. "A large body of soldiers were entering the gully leading to the camp with three dray loads of dead and wounded … I guessed at once that the military had made an attack on the Eureka Stockade, but I did not guess that Englishmen in authority had made such a savage and cowardly use of their power. I entered (the stockade) and a ghastly scene lay before me which it is vain to attempt to describe — My blood crept as I looked upon it. Stretched on the ground in all the horrors of a bloody death lay 18 or 20 lifeless and mutilated bodies — some shot in the face, others literally riddled with wounds — one with a ghastly wound in the temples and one side of his body absolutely roasted by the flames of his tent — Another, the most horrible of these appalling spectacles, with a frightful gaping wound in … his head through which the brains protruded, lay with his chest feebly heaving in the last agony of death. One body pierced with 16 or 17 wounds I recognised as that of a poor German whom I have often joked with. Newly-made widows recognising the bloody remains of a slaughtered husband — children screaming and crying around a dead father — surely the man that polluted the early dawn of a Sabbath's morning with such a deed of blood and suffering must have a stony heart if he does not think with keen remorse on the desolation of many a widowed heart his merciless work has left. But this sanguinary carnage, revolting as it is to the mind, is not half so sickening as the savage wanton barbarity of the troopers. Did not turn their swords on armed men, but galloped courageously among the tents shooting at women, and cutting down defenceless men … (A) trooper galloped up to Mr Naslam (reporter for one of the papers) and ordered him to join the government force. He … gave an excuse (which was strictly true) that he was unwell, when the wretch at once levelled his carbine and shot him in the side. Not content with this wanton barbarity he handcuffed him and left him on the ground weltering in his blood. Another man … awoke by the firing, went out of his tent in his shirt and drawers and seeing the savage butchery going on cried out in terror — "for God's sake don't kill my wife and children". He was shot dead." Even though the Diggers were slaughtered, over the subsequent centuries, their flag has come to symbolise very different things to different Australians. For a number of unions, the flag symbolises unity in the face of intimidation. For multiculturalists, it symbolises a diversity of people seeking to make Australia a refuge for the oppressed from all the countries on earth. For republicans, it symbolises the first steps in the long road for Australia to be independent from Britain. For white supremacists, it symbolises Australians wanting to make Australia a nation for the white man. "WE SWEAR BY THE SOUTHERN CROSS TO STAND TRULY BY EACH OTHER, AND FIGHT TO DEFEND OUR RIGHTS AND LIBERTIES." Although the slogan is consistent with union values, the miners themselves were not employees; rather, they operated more like entrepreneurs wanting an end to government regulation and intimidation. In addition, Lalor later entered parliament where he subsequently imported contract Chinese labour to break striking unionists. "irrespective of nationality, religion or colour, to salute the 'Southern Cross' as the refuge of all the oppressed from all the countries on earth." In addition to the diverse composition of the protesters, the trial seemed to target non-Anglo races for prosecution. Ironically, their acquittal led to John Joseph, a black man from America, being carried around the streets in triumph by 10,000 people. Although the protest itself and celebration od the acquittal of non-Anglo men were shining examples of cross-cultural integration, the progressive message was not universally shared. Over the next few years, white miners holding aloft the Eureka ideal subsequently slaughtered Chinese miners and lobbied to have restrictions placed on Chinese migration to Australia. It is these miners who have inspired the contemporary white nationalists who have tried to redefine the Eureka protests as protests by freedom loving capitalists wanting to free themselves of government and non-whites.
' Australia began her political history as a crouching serf kept in subjection by the whip of a ruffian gaoler, and her progress, so far, consists merely in a change of masters. Instead of a foreign slave-driver, she has a foreign admiral; the loud-mouthed tyrant has given place to the suave hireling in uniform; but when the day comes to claim their independence the new ruler will probably prove more dangerous and more formidable that the old.' Rather than 'the day we were lagged', said the Bulletin, Australia's national day should be December 3, the anniversary of the Eureka rebellion, 'the day that Australia set her teeth in the face of the British Lion'. Arguably, the diversity of viewpoints in relation to the Eureka Flag illustrates why it has become a great symbol of Australia. Most flags around the world have a predefined meaning that the public is expected to assimilate. While the Eureka Flag was designed with a specific meaning in mind, culture has redefined that meaning to something that reflects Australia’s evolution, and the different viewpoints Australia's evolution evokes. If Australia is ever to fulfill the Eurkea ideal of individuals having rights and liberties, it will never be via forcing everyone to think the same way.